This is the exact recipe and method that I use at home for my family’s whole wheat sandwich bread. My mom and sister were recently visiting and watched me as a baked a big batch of whole wheat bread. Their comments while we were baking made me realize that it may be useful to write this down for anyone else who needs a refresher. For this bread, I use a Bosch Mixer and freshly milled flour from my Nutrimill Grain Mill. This recipe is written exactly for this mixer and flour. I make no guarantees about whole wheat bread success if you are using different tools or ingredients. If you have a smaller capacity mixer, you may want to check out my recipe for Small Batch Sandwich Bread. When I teach classes, I use this same exact method in my classes. If you took a whole wheat bread class from me a while back, it is quite possible that this recipe has evolved slightly since we baked together. The main change being that I now consistently add one cup of white, organic flour (store-bought!) to the batch of bread. I’m still using vital wheat gluten and dough enhancer, but the white flour seems to help greatly with a great rise on the bread. As my sister, mom and I were baking, we also talked through lots of little techniques that can help with a great loaf of bread. We spoke about bread pan size, oiling the tops of the loaf, and the type of oil that I use. Every time I bake bread with someone, some specific questions come to light – maybe the sugar, type of salt, or oven temperature. Bread baking is also different during every season of the year, it’s one of the challenges that allows the baker a certain amount of pride when the loaves turn out perfectly. If you want to learn this method in person, or just need a refresher course, give me a call or email me for more information. This recipe uses a Bosch Mixer and freshly milled flour from a Nutrimill Grain Mill. If you want more information on the equipment or ingredients, let me know - I'm always happy to consult! Add water to bowl of Bosch Mixer fitted with the dough hook. Add olive oil, honey, white flour, 8 cups of whole wheat flour, vital wheat gluten, dough enhancer and yeast. Turn Bosch to speed one and mix until combined, about 30 seconds. Dough will be very wet, more like a batter consistency. Cover with bowl lid and let rest for 10 minutes. If you are short on time, you can skip this step. After ten minutes, open lid, add 4 more cups of whole wheat flour, and salt. Pulse a few times until combined. Turn Bosch to setting one and slowing add remaining flour about 1 cup at a time until the dough just cleans the side of the bowl and pulls away from the center post. For the last cup or so of flour, add it about ¼ cup at a time. The dough can be slightly wet, as it will continue to absorb liquid as in kneads. Turn the machine to speed 2, replace lid and knead for 8 minutes. Remove dough onto a large oiled bread board or counter top. Divide into 6 portions. I measure mine into 1 pound 6 ounce portions. This is the perfect size for the 8.5"x4" bread pans. 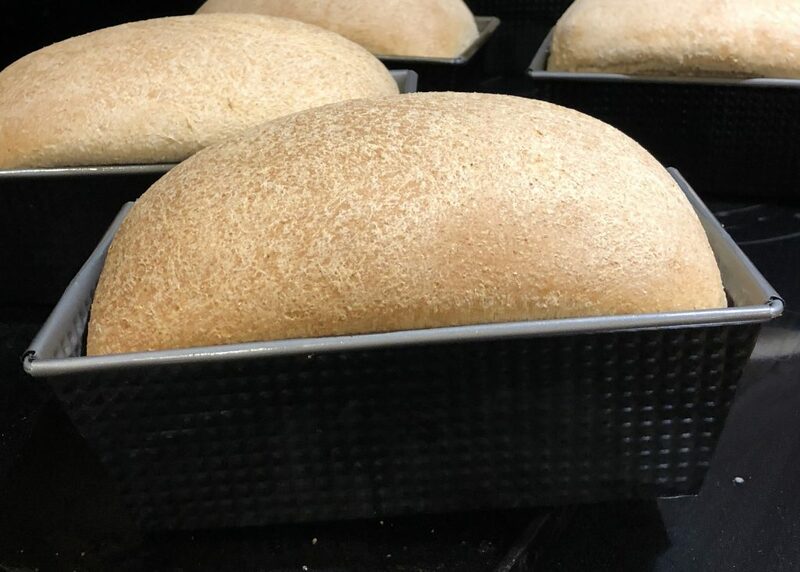 Note that bread pans may have a different rise since the whole grain breads seem to rise better in a narrower pan.If you have larger pans, you may need to make 5 loaves or make more dough to make 6 loaves. To make 6 larger loaves, increase water in step one to 7 cups and add about 3 cups of flour to the recipe - everything else can stay the same. Shape bread and place into oiled pans. Oil the tops of the bread with olive oil. Allow to rise in a warm spot, away from drafts, until the bread is about 1 inch above the top of the pan - about 45 minutes. While the bread is rising, preheat the oven to 350 degrees. Once the bread is risen, bake for 30 minutes until it is golden brown. Remove the baked bread from pans immediately and cool on racks. Allow to cool 3 hours before you bag it. These loaves can be frozen at this point. If you are curious, here is short video of my Bosch kneading this recipe.